Over the last year I’ve gone against faceless women, disfigured spirits, and grotesque revenants. Some people keep dangerous hobbies; skydiving and driving at monster truck rallies and glacier surfing. Me? I cast my soul into the churning waters of potential damnation and wait for a bite. Creepy, suspenseful with plenty of Japanese folk lore and culture; what more could you want in a horror genre? I just read the first installment (The Girl from the Well) last week so I was so happy to be able to read this one while it was still so fresh in my mind. These books have woken up my love for horror that has been sleeping lately, and I couldn't be happier about it. I am not a huge fan of Rin Chupeco - I want to read everything she writes because she is wildly talented! Tark is a normal teenage boy by day and an exorcist by night. Now he works side by side with Okiku -Ki- to kill those that the law would do nothing about, like the quarterback of the high school football team. When Kagura along with the cast of Ghost Haunts (a paranormal tv show) goes missing in the suicide forest in Japan, Tark along with his cousin Callie jump at the opportunity to help them. All too quickly Tark gets in over his head when all the ghosts start gunning for him am Ki, some ever Ki can't help him with. Will he be able to find Kagura and get out before it's too late? I like the cover of this one too - both books have that creepy cover that draws you to it. Unlike the first book which was from Okiku's POV this one was from Tark's. I honestly preferred Ki's point of view but I understand why this needed to be done - but I still kind of missed her OCD style counting. It starts off right in the action with Tark trying to exorcize a ghost using a doll in a bathtub. It may sound ridiculous but it was actually quite scary. When said doll was pretty much chasing him around that apartment trying to bite/ stab him, I cringed and was wishing I waited until morning to start reading. I loved Tark and Ki's relationship and how much it grew since book one. Though at the end I did think it was a little weird but it worked for this book. I liked all the Japanese culture that was thrown into this book. I felt like I was learning as I was reading and often found myself looking things up to know more. I definitely want to visit Japan now! I think this was the perfect ending to the perfect horror book. 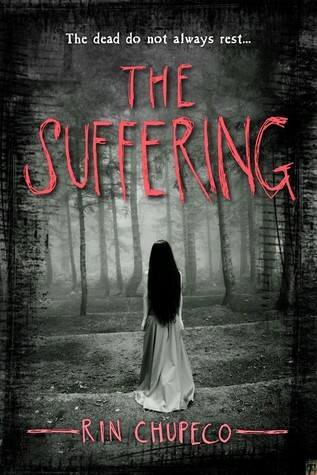 I highly recommend this book to anyone that is a fan of the horror genre. It has creepy parts but also has a good story behind it to offset it at times.